Fanfara Tirana is surely one of the most entertaining brass band coming from the Balkans. 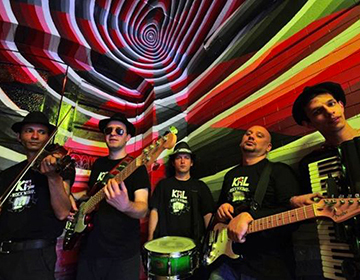 Formed on 2002 by a group of friends from the Albanian Army band who decided, in a light-hearted fashion, that it might be worthwhile to form such a band, just to see what might happen. 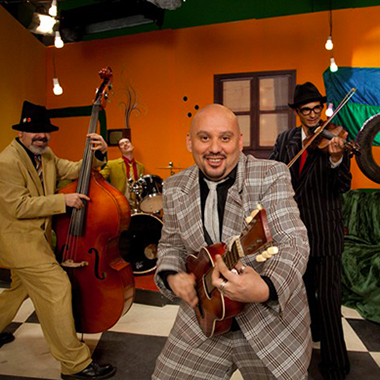 They contacted veteran singer M° Hysni Zela and persuaded him to come out of retirement and join them, which is when the serious fun started. Taking the time-honoured tales of heroes and lovers that are the backbone of the Albanian tradition and infusing them with the pumping rhythms of the best Balkan brass styles, they have created something truly innovative yet totally representative. Already blazing new trails at home and now ready for export. 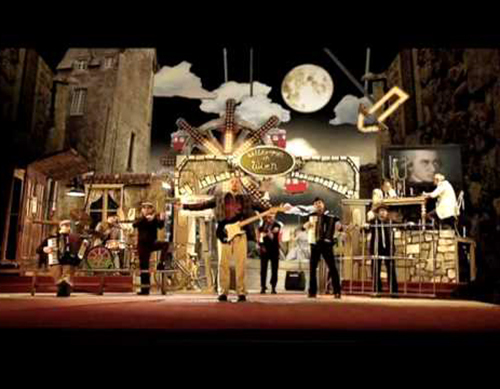 After headlining at Europe bigest festivals as Roskilde, Sziget, WOMAD ... selected at WOMEX 2007 and 2013, TOP 20 at World Music Charts Europe with their first album, TOP Of The World for Songlines Magazine 2007 and many other goals was time for a NEW ALBUM!, their new project, "KABATRONICS". 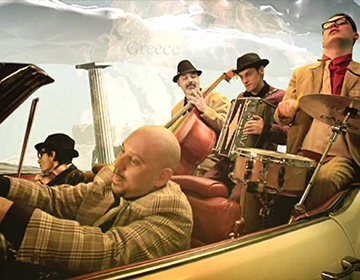 Their latest album, released by Piranha, "Albanian Wedding - a brass explosion" climbed higher and higher the World Music Charts Europe for months, but with their new studio work Fanfara Tirana has gone further on and delivered the whole album to the londoners manipulators, the brilliant minds of TransGlobal Underground. The result is a blast! Best World Beat Album and Best Music Video at IMA's (Independent Music Awards), headliner over the globe from China to Norway, from India to Germany. Several nomination as best album on magazines, Grammy's long list etc. Over 100 reviews with 4 and 5 starsat Rolling Stone, The Time, The Guardian, fRoots, Songlines, Manifesto, La Repubblica, Mondomix, Les Inrockuptible etc. Now they are working on Kabatronics Vol II, a new project with the Italian band Modena City Ramblers and on 2017 with the genius piano player and composer Robert Bisha. 2007 - Yet "Albanian Wedding" is a striking debut. 2013 ***** - "Yes i knew it was going to be good, but perhaps not this good. Kabatronics is a proper album like wot they used to make: diverse, consistent, well produced and with a whole that’s greater than its many impressive parts." ALIAS (IT) ***** - "Unique! If you miss this record, too bad for you. Here we are in the presence of two giants of no borders music with no ideological barriers, least of all when it comes to play. The marvel at what comes from Albania “committing a sin” with reggae, transgressing at the sound of a sitar, weaving electronics with brass and losing itself in voices coming from very far away in time and space." MONDOMIX (FR) ***** + MENTION “Mondomix M’aime" - "Un travail en profondeur qui évite les effets tape-à-l’oeil et soigne une approche musicale dans le respect des traditions approchées. Inspiré et heureux." IL MANIFESTO (IT) *****- "A stellar album! 14 resounding tracks! A star that truly shines and glare of its own! To hear, endless times. Especially if with each listen, that star shines more and more." THE TIMES (UK) **** - “A symbol of cultural fusion in 2013 who would fit the bill! 2007 - It’s a beautiful sound. JAZZTHING (DE) *FOCUS SELECTION -" This Albanian-British summit actually pours new wine again in the old bottles of Balkan hype." MELODI E UND RYTHMUS MAGAZINE (DE) ***** - “All the effort was worth it. Successful experiment. A milestone of Global Dance. Balkan soul and big beats." STUTTGARTER ZEITUNG (DE) - Phenomenal concert featuring the London based ethno-electronics of Transglobal Underground with the brass of Fanfara Tirana in a finely textured sound inferno. RHEIN-ZEITUNG (DE) - Astonishing appearance of Fanfara Tirana and Transglobal Underground A concert by transnational riff monsters. The seething mixture of loops, samples, drums and brass left the listeners (and dancers) both fascinated and delighted. The septet, with Niko the “voice of the past”, adding traditional Albanian vocal artistry additional played with incredible momentum and finesse. Rhythmically diverse, with interesting lyrics presented in the style of a Toasting Linton Kwesi Johnson, Fanfara Tirana meets Transglobal Underground burned like a borderless World Music fireworks display. OUTSIDERS (IT) **** - “Kabatronics, is just that, a centrifuge of sounds that is going to rewrite the 2013 chapter of “world music”. The new project has perfectly centered the goal. Amazing video of No Guns To The Wedding, traditions intertwined in the sign of delirium and irony. Sensational. It’s a captivating and danceable album, which hasn’t taken away anything from the frenzy these two groups are famous for when they’re on stage, as if the walls of the recording studio never existed. Everything moves, nothing is defined. Now we can say: finally something new"
BRESCIA OGGI (IT) - "Splendid performance. If there is an adjective well suited to the concert this is definitely "amazing". An extraordinary band." FOLKNOTES (IT) - "Fanfare Tirana, the Albanian version in Balkan fanfare: devastating." 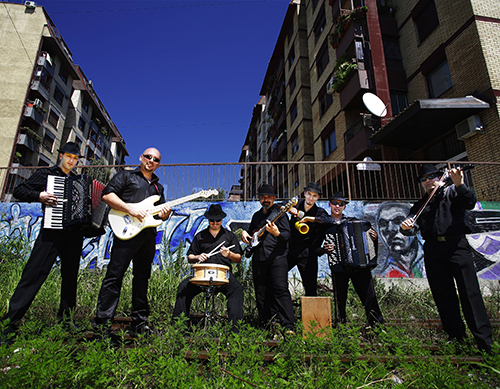 FOLK BULLETIN (IT) - "And that good music, rhythmic, insistent. The audience, who danced and sang incessantly throughout the concert. " LA REPUBBLICA (IT) -" A disruptive brass orchestra from Albania, which is winning the public over Europe." IL TRENTINO (IT) - "A wild concert of dance music." LIBERAZIONE (IT) - "A triumphal for Fanfare Tirana in the central squar.". MIGRANEWS (IT) - "While we leave an old lady says that she enjoyed it very much, she danced so much despite his arthritis and asks when we will be the next concert of Fanfare Tirana." WNYC RADIO (USA) - "Fabulous record!"